Life on the American frontier in the 1800s was probably anything but fun. It was an unforgiving existence where you had to fight for survival every day. If there is a game that has ever simulated the brutality and danger of this type of life more accurately than Hard West, then I don’t know what it would be. Hard West is as cruel in its gameplay as it is bleak in its storytelling. It's especially tough at the beginning, when you get thrown into the game with little more than a barebones explanation for how gameplay works. After you get your feet under you, though, you start to see some strengths that make Hard West at least moderately enjoyable. The game is an interesting take on the now surprisingly crowded turn-based strategy genre. Note that “interesting” doesn’t translate directly into “great” though -- Hard West sometimes simulates the drudgery of its subject matter a little too accurately for its own good. There is very little in this game that will make you feel good. It is a dark, nihilistic experience where you never win as much as you just survive or, at best, achieve revenge. The game’s story is told in a series of chapters that are loosely tied together, which each chapter containing a stand-alone mini story. The protagonist that you control in one chapter may be the final boss in a later chapter. Each chapter features hardships like starvation, bandits on the loose, or madness. The supernatural makes an occasional appearance in the game too in the form of a powerful but dangerous artifact, a curse, or the devil himself. These little bits of the supernatural occasionally carry into the game’s missions in the form of special abilities or monster enemies. Whatever form the supernatural takes, it is never a shiny happy one that benefits the world. The power of artifacts comes at a high cost and the devil can’t be outwitted. Hard West, for the most part, is a well written game that keeps a consistent tone from beginning to end. If you are in the mood for this type of experience, then you will find what you are looking for here. On the other hand, if you are suffering from nihilism fatigue after binging on a season of The Walking Dead, then you may need a palette cleanser before you play this game. 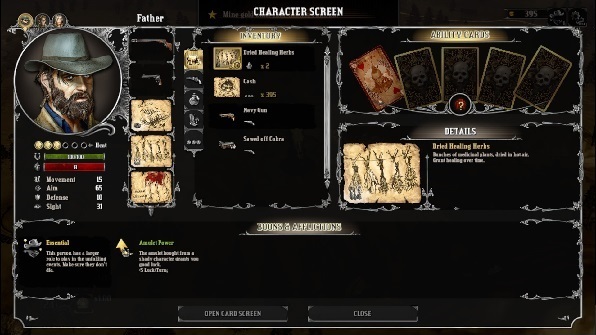 Hard West is, at its core, a tactical turn-based combat game. During your missions, you and your enemies take turns moving around the map, finding cover and better firing positions, shooting, reloading, and using special items. On its surface, Hard West does not appear to offer a lot that is new in this genre. However, after you get massacred a few times, you may come to appreciate the nuances that the game brings to the table – nuances that you must understand in order to survive. The most important distinction that separates Hard West from other games in its genre is that it de-emphasizes firepower and makes cover the single most important variable in combat. Just about every gun in this game is highly lethal, killing everyone (friendly or enemy) in one or two hits. A shot against an uncovered foe is almost a guaranteed hit, and a shot against an enemy in full cover will do no better than graze him. Whether you can defeat your enemies in combat has more to do with movement and positioning than it does with what special abilities you have or how powerful your guns are. You find yourself outnumbered on every map, which means that you have to get your characters into great firing position and find clever tricks for hitting exposed enemies. Rest assured, these enemies will use those tricks against you, often surrounding you and leaving you in a position where you can’t find good cover. The AI can be frustratingly efficient in this regard. There is a short tutorial at the beginning, but it doesn’t teach you much about effectively flanking and using cover. You find out these lessons the hard way – with your characters getting gunned down and you failing missions. You don’t see enemies on the map until they are in your line of sight, which means that it is very easy to get ambushed by enemies that you didn’t know were there. It is also easy to get a character killed just by all of the enemies ganging up on one guy and picking him off in just one or two combat rounds. Hard West has no checkpoints in missions, which means that you can lose a lot of progress by making one or two critical mistakes. Over time, you learn how to be more cautious and select more favorable firing positions. In the meantime, the first few hours of Hard West are quite punishing. Once you are along in the learning curve, it gets easier, and it becomes satisfying to overcome challenges that look darn near hopeless at first. It takes a while to get there, but combat gets fun through the middle portions of the game, when you know what you are doing and it is still relatively fresh. The turn-based combat isn't all that's on offer, though. In between missions, when most of the game’s story is told, you get to travel around a regional map. During these parts of the game, Hard West is like a text-based RPG/adventure. There are locations where you can do the usual stuff like go shopping or sell a little bit of loot, but there are also lots of locations on each map where you have to make some kind of role playing or story choice. You find stranded settlers –do you help them or rob them? You save an innocent man from bandits – do you let him join your posse or send him on his way? You find a dilapidated house – do you stay away from it or search it for valuables? Just about every choice has some sort of immediate consequence. Some chapters have a strategy element as well, such as the chapter that requires you to manage an expeditionary force in search of an ancient artifact. In that chapter you have to manage the size of your force against your inventory of food – keeping the force strong enough to make progress without starving to death. 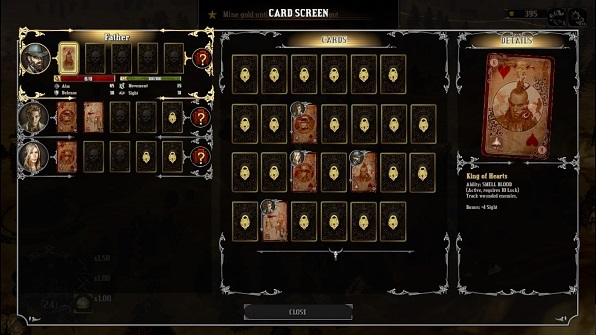 The game also has some rudimentary RPG elements like a small inventory and a clever system for giving your characters special abilities: playing cards. During your travels, you find cards, and before each mission, you can assign these cards to your characters. Each card provides a bonus, and if you combine them correctly, you can earn extra bonuses by building a good hand. A lesser hand (e.g. a pair) may provide a small movement bonus, whereas a great hand (e.g. a royal flush) may provide a significant hit point bonus. The playing cards are a clever addition to the game that enhances the use of the Old West setting. Unfortunately, mostly everything else outside of combat doesn’t add a lot of value to the game. The non-combat overworld sections almost feel like minigames. They don’t integrate well with the combat – they are more like an obstacle that you have to overcome to get to the game’s missions. They do a decent job of telling the game’s story, but the choices that you make don’t seem to affect that story. Most choices are simple, short term affairs that boil down a simple risk/reward relationship. During the game, I saw no evidence that they affect the plot. These sections also tend to use systems that they don’t explain very well, which means that you will be shooting from the hip and making a lot of random choices whose consequences you can’t really understand. For instance, there is one section that involves using a laboratory to make scientific advancements. You can choose what area to focus your research on, but you have next to no idea about the quality of the improvements that you will get from that research and how useful it will be. You also don’t know whether it is worth investing in any research or just saving your resources for something else. Hard West also makes an attempt to include stealth. For some missions, the enemies do not become active until you enter their cone of view and they sound the alarm. You can temporarily subdue enemies, but you can’t remove them permanently without killing them. If one enemy sees you, every one of them becomes instantly alert. Subdued enemies become hostile immediately when combat begins. Stealth is ultimately worthless in this game for doing much more than a little bit of scouting and getting your characters in favorable firing position for the first round. This game would have benefitted from either getting rid of stealth completely or giving you a system to knock out enemies, silently kill them, and stash the bodies. There are supernatural elements at times but, for the most part, combat is based on realistic mechanics with realistic, period-appropriate weapons. The game benefits from this faithfulness to its subject matter, but it suffers from it too. There are only so many ways that you can employ pistols, shotguns, and rifles before you are using the same items and tactics in each chapter. Combat doesn’t evolve much throughout the game, which makes the game somewhat repetitive as you get closer to the end. Each chapter is mostly a stand-alone vignette in which none of your gameplay choices or story choices from the previous chapters carry over. For each chapter, you are often starting fresh with no inventory or special abilities. There is no sense that the game is changing as you progress through it. As a relatively small budget indie game, the cards are stacked against Hard West from the outset when it comes to visuals. The drab Old West setting, the use of fully-rendered 3D graphics, and the game’s focus on gritty realism make the task of producing an attractive game even more difficult. Unsurprisingly, Hard West isn’t a colorful or a stylish game. With that said, the game doesn’t look bad. It at least looks crisp and competently put together and the character animations in combat are very good. The fonts are appropriate and the artwork is adequate. Likewise, the music does not stand out, but it fits the setting perfectly while reinforcing the game’s tone. This game doesn’t subsist on its production values and its presentation, but at least those parts of the game don’t get in the way. Hard West is a hard game to rate and judge. It is a game that is fairly limited in its scope and you have to be in the mood for what it offers. Even if you are in that mood, it is hard to enjoy a game that makes darkness and suffering so central to its core. You also have to be in the mood for a challenging experience that leaves you on your own to survive, perhaps to a fault. It is a game that respects and delivers on its setting, however, and backs up its mature subject matter with solid turn-based gameplay. There is a lot of competition in this genre nowadays, which makes a game like Hard West a little harder to recommend than it used to be. If you aren’t a big fan of turn-based combat, then Hard West is probably not a game for you. If, however, you have played through the XCOM series, Wasteland 2, or even the Shadowrun reboot RPGs, then Hard West will provide something a little different if you are still looking for more turn-based combat. If you are a fan of deep, complex strategy games, then the turn-based spy simulator Phantom Doctrine is one that you will want to love. Unfortunately, the game makes it extremely difficult for you to do so. It's a shining example of how a game with a bunch of great ideas can undermine itself repeatedly with terrible implementation.